I have this thought process that if you put dirty stuff into an appliance, add a cleaning agent, turn it on, let it do its thing, and clean items come out, then the appliance itself should be getting clean in the process too. Apparently, I’m wrong because that big box you put your dirty dishes in, may be filled with nasty gunk, and it may not be getting your dishes as clean as you might think. 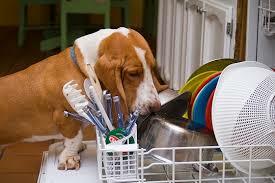 When’s the last time you cleaned your dishwasher? If you’re like me, you probably don’t remember, and sadly, several articles I read said you should do it once a month! Take the bottom rack and thoroughly clean any accumulated debris or gunk built up in or around the drain area. Fill a dishwasher-safe dish with one cup of white vinegar and place it on the upper rack of your empty machine, close the door, and run a hot-water cycle. This should wash away the majority of the gunk, grease, and grime. There could still be some stuff left around the outer seal. If so, simply take an old rag and wipe it off. To deodorize your dishwasher, sprinkle a cupful of baking soda across the bottom of the machine and run it on a short hot-water cycle. That’s it. Now your dishwasher should sparkle and smell fresh. One side note here – if your dishwasher has a mold invasion, pour a cup of bleach in the bottom of the basin and run a full cycle only if the interior is NOT stainless steel. Caution: using bleach on a stainless steel dishwasher interior will likely cause the metal to erode. But no worries, I just used vinegar and baking soda on my stainless steel dishwasher, and it turned out nicely.